"Super-yachts", in other words pleasure boats over 24 metres in length, represent the highest bracket of the luxury sailing market. On a world level the boatyards that produce super-yachts are concentrated in a limited number of countries; among these undisputed leaders are the Italian boatyards with a production of boats with the highest average value. Italy therefore holds a position of leadership on a world level; Italian boatyards in fact, well known for their design, styling and interior finishings are world leaders both for number of projects and for overall length of the units being built. Italy attained the record of greatest producer of super-yachts in 2000, beating the United States, which until then had been undisputed leaders. 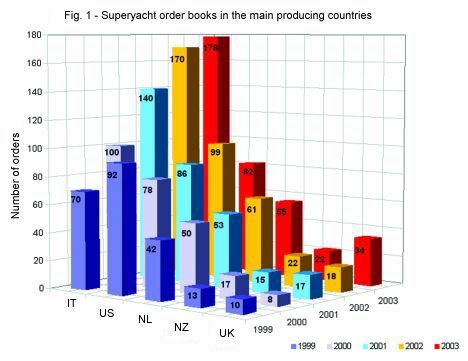 It must be considered that in 1999 Italy had 70 super-yachts in production and a year later 100, reaching 170 units in production in 2002 and 178 in 2003: an increase of 154% in just five years (see figure 1). These "super-yachts" cannot fail to be privy to a very wealthy clientele that, in the glossary of high finance is defined as "ultra high net worth individuals"; this elite category includes those individuals with financial assets of over thirty million dollars. In 2002 the number of "ultra high net worth individuals" present around the world amounted to about 60,000, of which more than half evenly distributed between the USA and Europe. The fact that from 1996 to 2002 the number of "ultra high net worth individuals" rose by 60% shows how even a negative macro- economic result has a lesser impact on this clientele compared to the average one of the sector. This cannot fail to be reflected also in the demand for super-yachts, these too marginally affected by the general economic trend (for these boats, in fact, we speak of anti-cyclical demand). But the size and evolution of the market of these "floating dreams" as well as depending on the number and the wealth of the "high net worth individuals" also depends on the infrastructures dedicated to luxury pleasure boating. Looking closely, sailing infrastructures represent a fundamental element for the development of pleasure boating; master in this is the C“te d'Azur which with the number of boat moorings at its disposal attracts many Italian and foreign pleasure sailors who desert our coasts due to the lack of moorings. This last aspect has a considerable effect on the development of the luxury boating market, which is not only affected by the number of marinas and overall number of moorings, but also and above all by the presence of suitable fully equipped port structures, in terms of professionalism and services. As owners know only too well when they are forced to give up the dream of a larger boat as they do not have the mooring and port structures ready to welcome these maxi floating villas. 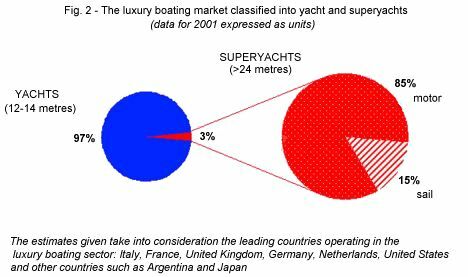 Figure 2 shows some analyses and estimates carried out on the luxury boating market during 2001; it emerges that 3% of this market, evaluated and estimated in terms of units of pleasure boats produced and marketed, was represented by the super-yacht production category; of these the super motor yachts represented the main goods type category totalling 85% of the units considered. 2001 trends are also confirmed in 2003, which saw world construction of 482 super-yachts of which no less than 178 were sold by Italian boatyards. 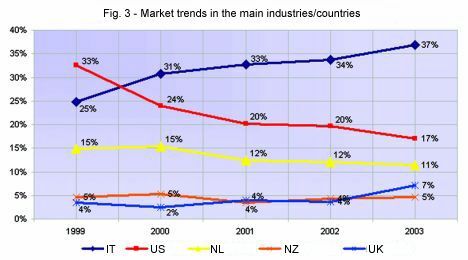 Figure 3 shows market share trends of the main producing countries of super-yachts, from 1999 to date. This analysis shows that Italian superiority leaves no room for doubt even if, however, there was in 2003 a slight downturn that affected the whole super-yacht market, basically due to normal adjustment of the market as a consequence of a decade of strong economic growth in the sector. This drop in the market has in no way however touched the main players in luxury sailing like the Ferretti Group, the Azimut Group, the Rodriguez Group and Sunseeker, which have even registered a further growth in orders. The sector in its historical evolution - bearing in mind the slow down in 2003 - has grown over the last 5 years by an average 15% a year; this growth has affected both sailing and motor superyachts. 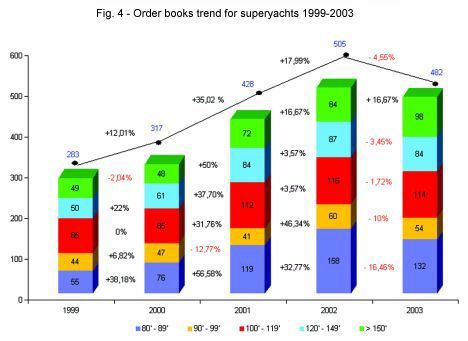 Analysis of the evolution tendencies of the super-yacht market highlights the fact that during 2003 the units belonging to the bracket of super-yachts over 150 feet in length confirmed their record value of 2002, with a + 16.67% (see figure 4). This latest positive trend is entirely due to motor boats, which make up the main unit of luxury pleasure boating. Of the 482 super-yachts in construction in the world, 69 have sails and 413 engines, with a prevalence of medium large units. These data can be further exploded, separating the sail units from those with engines. 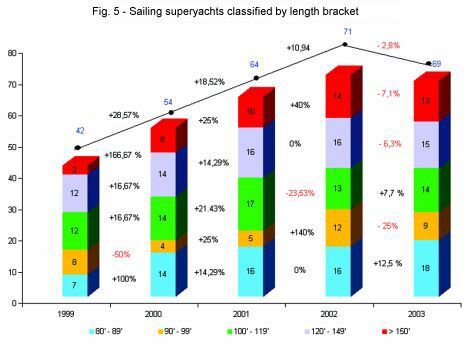 For super-yachts with sails (see figure 5), market tendencies reveal that the only growth in orders is in boats belonging to the 80 to 90 foot bracket and to the 110 to 120 foot bracket. 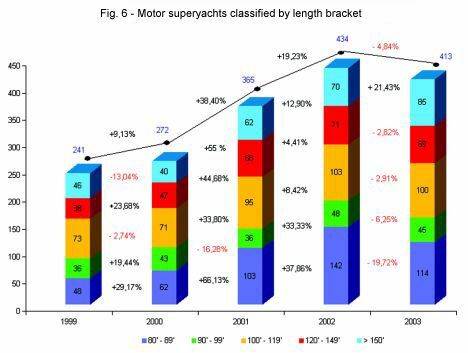 For super-yachts with engines (see figure 6), the over 150 foot units reveal a record over the last 5 years with a + 21.43%; on the other hand units in the 80 to 90 foot bracket show the greatest negative variation with a -19.72%. Over the last 5 years therefore, the market of luxury sailing super-yachts has almost doubled, showing considerable dynamism. The scenario for the new boating millennium is characterised by the presence of a more competitive market context, also favoured by a more intense concentration of market shares of the main players in luxury boating. Italian boating therefore, together with other industrial sectors such as luxury cars, fashion and jewels, represents a strong point of "Made in Italy"; an example of successful entrepreneurship that is recognised all over the world.